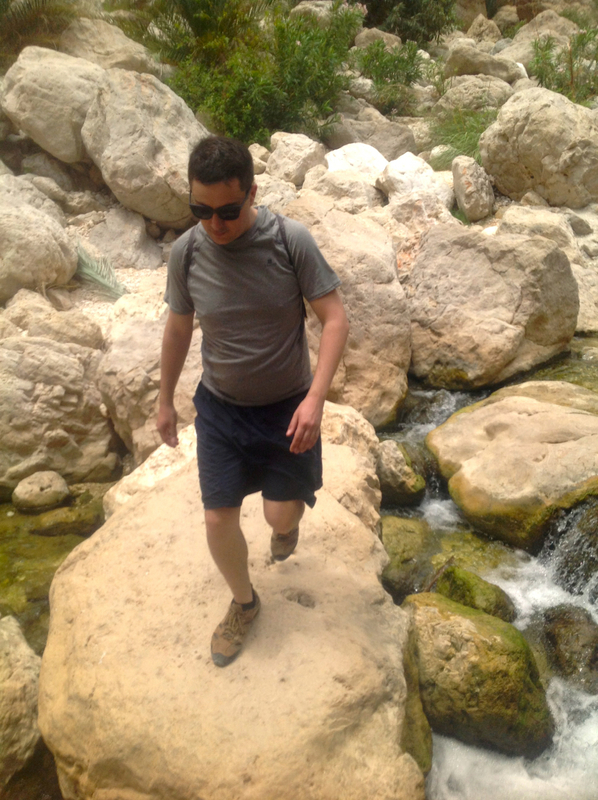 This hike fast-tracks you through the beautiful palm-lined Wadi Shab to the hidden cave at its heart, where you’ll find a waterfall and a stunning turquoise blue pool. 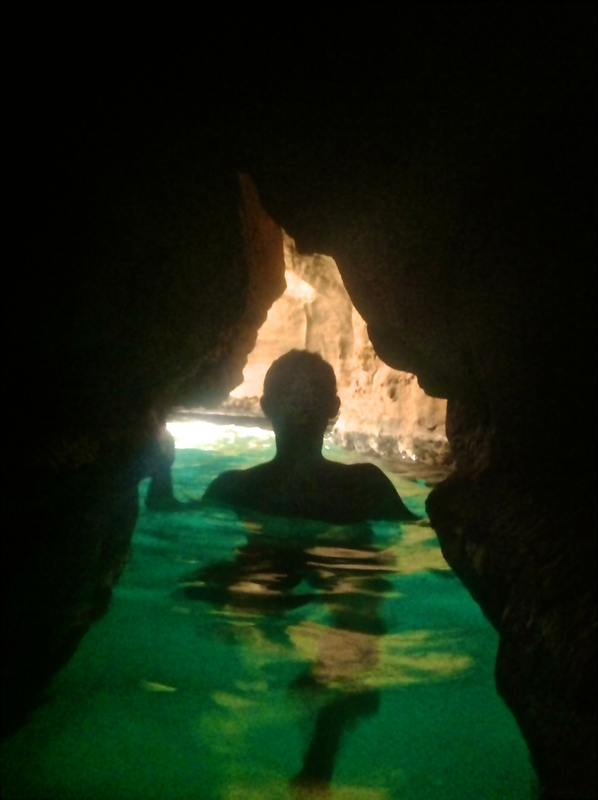 The hidden cave can only be reached by swimming through a small gap in some boulders. There’s plenty of wildlife – birds, fish, crabs, lizard, dragonflies and butterflies – to spot along the way and lots of opportunities to hurl yourself into the refreshing water from various heights. This is a wet walk! If you’re sun-phobic or female (it’s a conservative country after all!) stay covered up with a rash vest when swimming and it’ll be dry in no time on the walk back. Waterproof sunblock, sun hat, sun glasses..
Yeah, you’ll look like a douche but the photos will be worth it! Can’t Swim? This isn’t the adventure for you. FLASH FLOODS: It’s best to avoid the wadi if it’s raining or has just rained as there is a risk of flash floods. November – March is the most tolerable time of year but the refreshing water makes it attractive in the hotter months too. 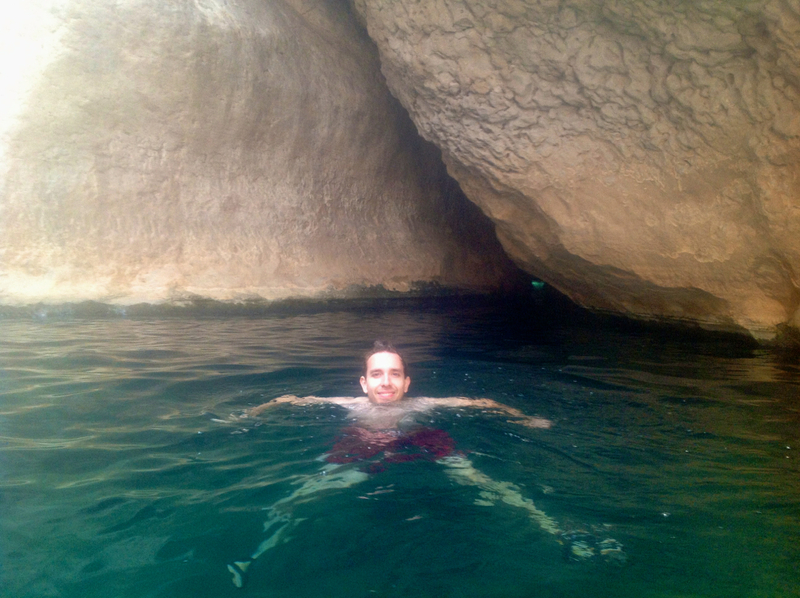 If you can, go on a weekday as the new highway has made the wadi a very popular weekend getaway for Muscatis. 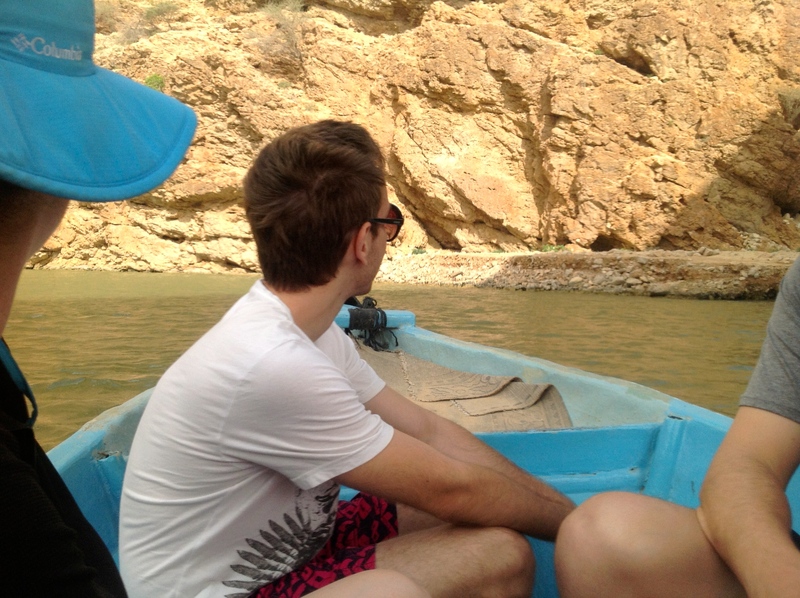 Alternatively, plan to enter the wadi no later than 8am and you’ll have it mostly to yourself on the way in but experience a different atmosphere on the way out as the parts closer to the road fill up with people. Take the Highway 17 from Muscat towards Sur. 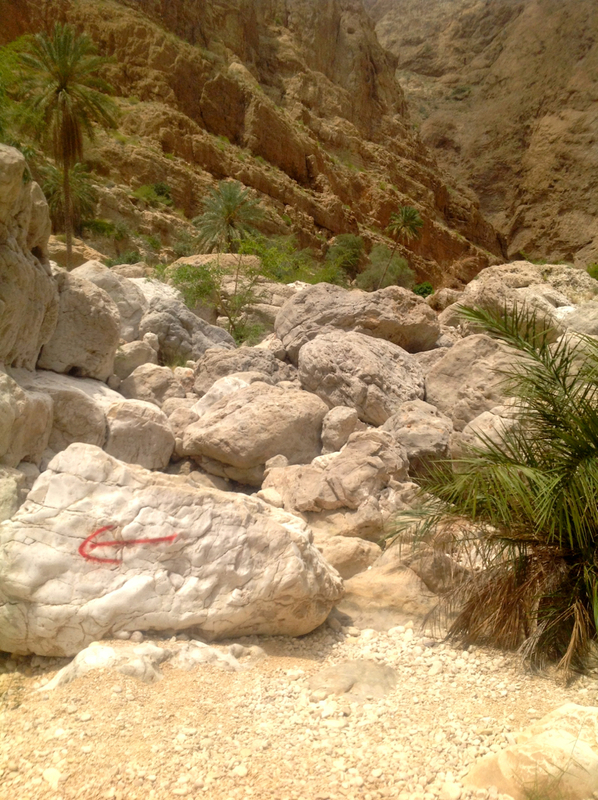 After 1.5 hours, start looking out for the exit marked with a brown “Wadi Shab” sign (multiple signs to the Wadi Shab Resort on the way will make sure you’re ready for it). 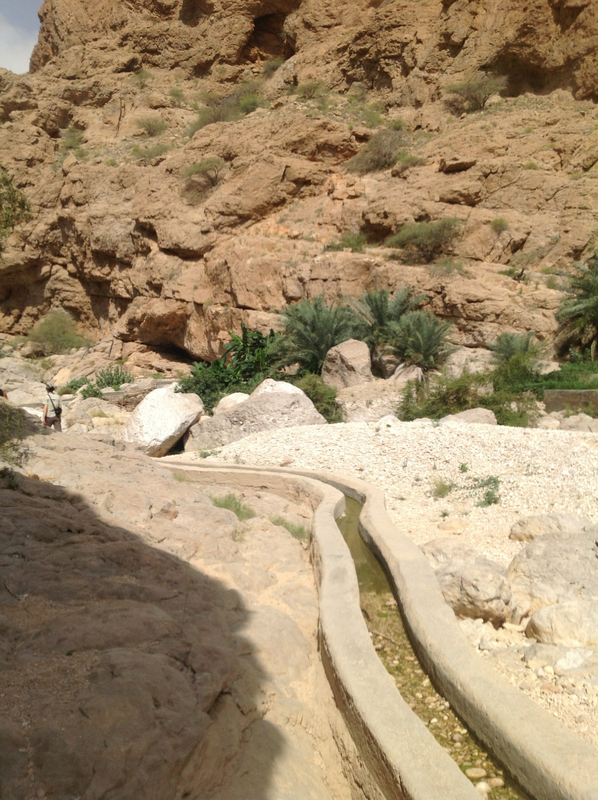 Take the Wadi Shab exit, cross under the highway and drive south towards Tiwi. You’ll cross over a dam/bridge as you get to Tiwi and you’ll see the highway overpass going over the entrance to the wadi. Take a right after you’ve crossed the dam and you’ll get to the parking area under the overpass. 1. River Crossing From the car park, walk to the mouth of the river and look for the boats that ferry people across. The official price is 0.200 OR but expect to be asked for more. Alternatively you can also consider swimming across or when the river is low it’s possible to wade across at certain points. 2. Beaches Walk up the canyon with the river on your left. The sandy “beach” by the river becomes a wide pebble beach. There is no obvious defined path but just make sure that when the canyon narrows again that you end up on the right side, to the right of the river. 3. Catwalk Walk along the river and look out for rough concrete steps that denote some sort of path. 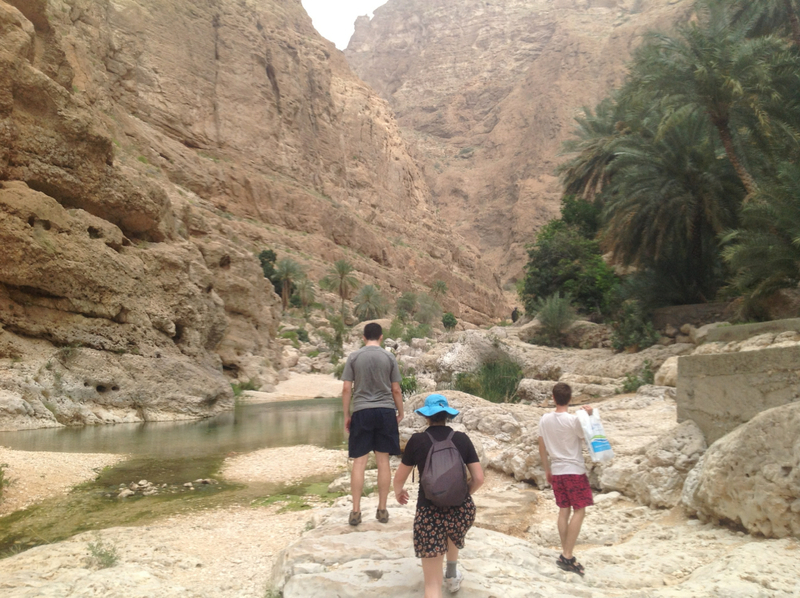 You can also follow the black water tubes snaking up the right side of the wadi and you should end up on a catwalk that climbs up the right side of the canyon. You’ll soon find yourself on a catwalk above some deep pools of turquoise water. The small caves on the right are often used as picnic spots. View from catwalk (looking back). 5. Red Arrows Start looking for the big boulder with a red arrow on it. 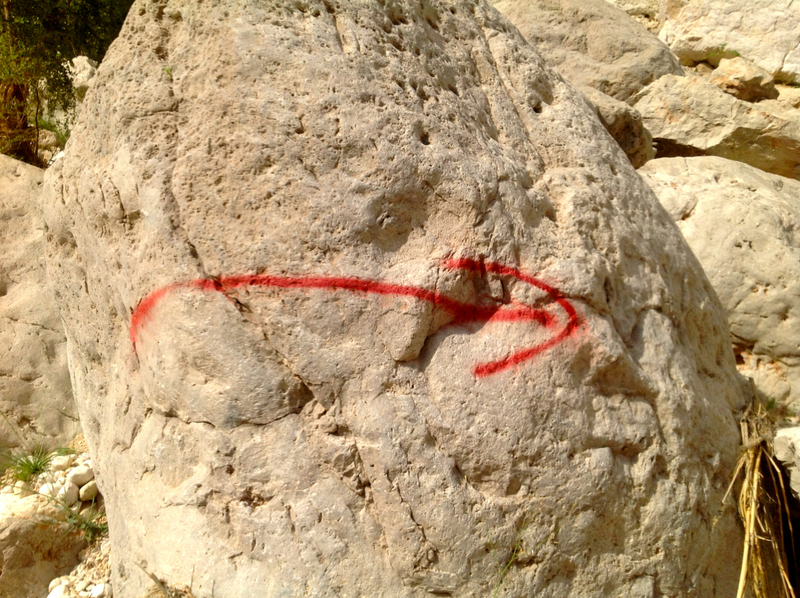 Follow the arrows across to the left side of the wadi. Keep your eyes peeled for more red arrows, they will guide you through the boulder field. 6. Falaj Highway The red arrows take you to the water channel (falaj in Arabic). You can walk on this rather than scrambling through the boulder field (although that can be fun too!). Keep your eyes peeled for the red arrows which continue to guide you. 7. End of the Road The arrows deposit you at the end of the boulder field. You’ll see a ramp-like rock formation ahead. You can either go around or over it and you’ll soon arrive at a pool. This is a decent place to stop walking and start swimming! Ditch your gear and shoes (unless you’ve got sandals) and wade into the cool, cool water. 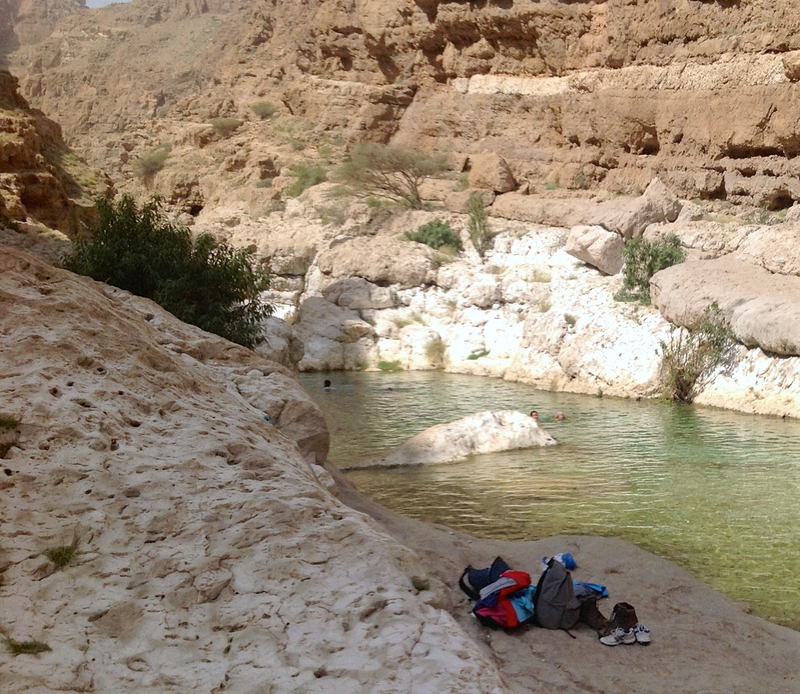 Make your way up the wadi, swimming and wading through a series of pools. 8. Through the Keyhole You’ll soon make it to a longer pool that is fairly deep. Swim the roughly 30m to the rock wall that blocks the end of the pool. It looks like you can go no further but in reality you’ve made it to the best part! Look for the big crack in the rock and the small arch at the base of it. Depending on the water level, you will either have to swim under the arch or it may be possible to pull yourself through the it with your head above water. The tunnel is only 3-4m long. 9. Hidden Cave You’ve made it! 10. Way back The way back is simple – just reverse the directions. 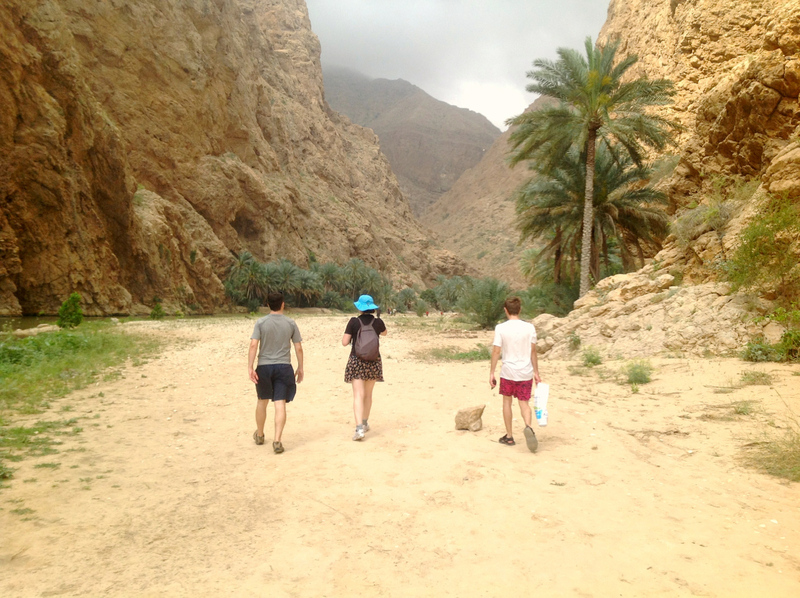 Or, better yet, explore some more – check out tracks higher up the wadi, look for fossils and wildlife. It’s hard to get lost in a valley after all! * this is true at time of writing. Obviously employ caution and check for rocks before jumping! 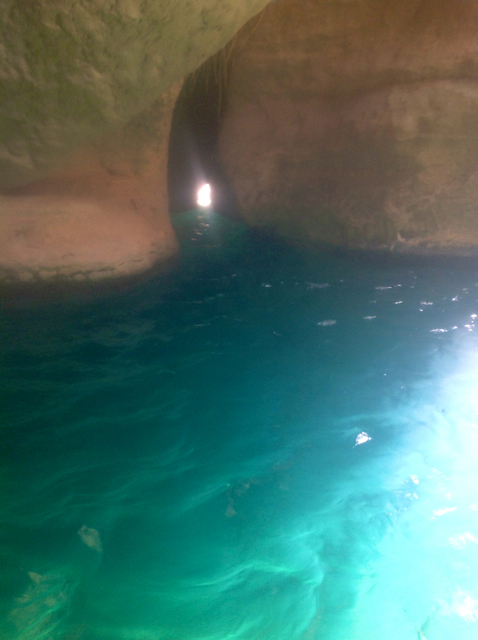 I am interested in visit the wadi from Muscat. You will have to rent a car to get there. The driving directions are under “Getting There” in this post. The other alternative would be to find a company that does a guided tour and will drive you there. Do you any driver who want to drive my family there on 20th March from Port Sultan Qaboos?